Are PCG’s Extrapolated Medicaid Audits in Violation of State Statute? Public Consulting Group (PCG) is one of the contracted entities conducting Medicaid post-payment audits in North Carolina. I’ve heard rumors that NC Department of Health and Human Services (DHHS) is not renewing PCG’s contract, although I have found no evidence to corroborate this rumor. Regardless, right now, PCG is here and the Medicaid post-payment audits continue. And PCG continues to extrapolate. For more information as to the extrapolations, see my blog: How Does $100 Become $100,000? Check for Clusters! But is PCG legally allowed to extrapolate? Oh, of course it is allowed to legally extrapolate!! The contract between DHHS and PCG allows PCG to extrapolate, right? But…what if….the extrapolations are not being conducted legally? “(i) Prior to extrapolating the results of any audits, the Department shall demonstrate and inform the provider that (i) the provider failed to substantially comply with the requirements of State or federal law or regulation or (ii) the Department has credible allegation of fraud concerning the provider. Of all the Tentative Notices of Overpayment (TNO) that I have seen, the actual TNO states the extrapolated amount and states that the audit is extrapolated because “(1) the provider failed to substantially comply with the requirements of State or federal law or regulation or (ii) the Department has credible allegation of fraud concerning the provider.” There is no more detail. The TNO literally regurgitates the statutory language into the TNO. Does that constitute “demonstrating”? Better yet, if a provider receives the information that “(1) the provider failed to substantially comply with the requirements of State or federal law or regulation or (ii) the Department has credible allegation of fraud concerning the provider” CONCURRENTLY with receipt of the extrapolated amount, does that notice meet the statutory criteria of PRIOR TO? Question #1: Does regurgitating the statutory language meet the requirement that the State demonstrate the noncompliance? Question #2: Does the Department sending the reason for the extrapolation concurrently with the extrapolation meet the statutory requirement to inform the provider prior to extrapolating? Last night I was checking my daughter’s homework. She had to read an article on Abraham Lincoln. Then she had to answer reading comprehension questions about the article. One question was something like, “What is this article primarily about?” The article discussed the Civil War, Lincoln, the Gettysburg Address, Lincoln’s top hat, Lincoln’s assassination and Lincoln’s gravesite. My daughter answered “B: Abraham Lincoln’s presidency.” (Which was wrong). In the above scenario, I informed my daughter that she was wrong. But I failed to demonstrate how or why she was wrong. Similarly, N.C. Gen. Stat. requires that the Department demonstrate and inform the provider that the provider failed to substantially comply with the requirements of State or federal law or regulation or that the Department has credible allegation of fraud concerning the provider. So, does PCG demonstrate and inform the providers that the provider failed to substantially comply with the requirements of State or federal law or regulation or that the Department has credible allegation of fraud concerning the provider, simply by restating the identical language in the TNO? Ok, how about Question #2…? How important is something to occur prior to versus concurrently? I mean, at least it is done, right? Who cares whether the action is done prior to or concurrently? Think of skydiving. I tell you to be sure to put on your parachute prior to jumping. Instead you hold your parachute, leap out of the plane, and attempt to put on your parachute contemporaneously as jumping. With the amount of air resistance you encounter after you jump, you are unable to get the parachute secured and you die. Let’s look at a less grotesque example…Think about eating…I tell you to open your mouth prior to inserting the piece of chocolate cake into your mouth. Instead you insert the piece of chocolate cake into your mouth while you concurrently open your mouth. Sure, you get some cake into your mouth, but the majority of the chocolate cake is smeared all over your face. Can PCG send you one letter saying you are non-compliant while concurrently informing you of the extrapolated amount? Or is that a bit like squashing chocolate cake into your face? I cannot take credit for this blog. I cut and pasted the test from WRAL. But…WOW!!!! Raleigh, N.C. — A state employee who helped oversee the construction and rollout of the NCTracks Medicaid billing system now works for Computer Sciences Corp., the contractor responsible for the troubled project. Paul Guthery was an IT manager at the Department of Health and Human Services, where he had worked since January 2010. At a hearing Wednesday, State Auditor Beth Wood described him as the agency’s “point person” for CSC, responsible for certifying NCTracks’ testing process. At least one good-government watchdog says his jump from supervising the company to working for it raises the appearance of a potential conflict of interest, one that the state should try to avoid in the future. According to public records, Guthery began working for the state on Jan. 1, 2010. His last salary was $126,500 per year. He stopped working for the state Aug. 27 and soon after began working for CSC as an executive account executive. Doctors, hospitals and others who render care for patients covered by Medicaid, the state-federal health insurance program for the poor and disabled, must use the CSC-built NCTracks system to get paid for those services. The system went live July 1 and soon after become the focus of controversy, with providers saying it was nearly impossible to submit claims and that payments were delayed by months. The delays threatened to drive some providers out of business and complicated care for thousands of patients. Since then, the state and CSC have struggled to right the program. It was in late August, as providers bombarded lawmakers and the governor’s office with complaints about the system, that Guthery made the jump to the private sector. Guthery declined via email to speak with WRAL News, deferring to his company’s corporate communications department. Michelle Sicola Herd, a spokeswoman for CSC, declined a request for an interview and was not willing to speak on the record about the circumstances of Guthery’s hiring. Officials with DHHS downplayed Guthery’s part in the rollout of NCTracks, saying Thursday that he never occupied a position in which he would give the final word on the program going live. “One of the key things is that Paul was one of many people involved in this project, a very large project going on for a very long period of time,” said Ricky Diaz, a spkesman for the department. Diaz emphasized that an outside testing group reviewed the stability of the NCTracks system before state officials turned it on July 1. But Wood blasted the role of that third-party overseer, saying the company hired for independent verification and validation of system testing had not actually conducted any independent verification. Rather, they merely collected information from DHHS and CSC and summarized it in a report. During a hearing Wednesday, Sen. Jeff Tarte, R-Mecklenburg, asked Wood who was responsible for signing off on reports that system testing had been completed and was successful. “The agency,” Wood answered, adding, “The point person that was at the agency is now working for CSC.” That person was Guthery. Diaz said state personnel laws prevent him from talking about what, if any, steps were taken to try to keep Guthery as an employee. But he emphasized that the state had taken strides to get the system on track, pointing out that it has been under construction for more than 10 years. “There have no doubt been challenges. This is a very large transition for the state of North Carolina,” he said. “The NCTracks project has, to date, paid $3.8 billion to North Carolina health care providers, as well as processing more than 78 million claims.” With regard to Guthery, Diaz said state law does not currently prohibit employees who work with a contractor from taking a job with that contractor. By contrast, had Guthery taken a job as a lobbyist, he would have needed to wait six months before working with the legislature or his old employer. No such cooling-off period applies to employees in other lines of work. Jane Pinsky, with the North Carolina Coalition for Lobbying and Government Reform, says lawmakers should consider changing that. “If I’m a skeptical, cynical citizen, the question is, did he (Guthery) give them a pass and then they gave him a job?” Pinsky said. Earlier this year, another high-ranking DHHS staffer left for a private-sector job. Former state Medicaid director Carol Steckel was recruited to overhaul North Carolina’s system but left abruptly for a position with Wellpoint, a managed-care company based in Florida. Pinsky pointed out that Wellpoint could end up bidding to run some or all of North Carolina’s Medicaid services under the McCrory administration’s planned reforms. “In state government, and in DHHS, it is not unprecedented for employees to go work for vendors,” Diaz said. Asked if he thought the Guthery situation could be viewed as a conflict of interest, Diaz said DHHS was being “very transparent” with regard to the situation. Asked if the agency would put any policy changes in place, Diaz referred to DHHS Secretary Aldona Wos’ efforts to improve contracting practices more broadly. “I think what you’ve seen is this secretary has placed a heavy emphasis on contract oversight and compliance,” he said. But Pinsky says the problem could be addressed in other ways. “One thing you can do is tell the contractor that, as a condition of the contract, they can’t hire anybody” in the agency, she said. She also suggested the possibility of a non-compete clause for employees hired to administer contracts. Yesterday (11/20/13), State Auditor Beth Wood appeared before the Joint Program Evaluation Oversight Committee meeting. Lawmakers and Wood criticized NCTracks, its rollout, and the lack of accountability on the part of the administration. Sen. Stan Bingham, R-Davidson, even asked whether criminal charges could be filed against whomever was in charge of the NCTracks rollout. The Department of Health and Human Services (DHHS)? Computer Sciences Corporation (CSC) (the company who designed NCTracks)? Independent Verification and Validation (IV&V) Contractor? (the third-party contractor hired for independent verification and validation of NCTracks)? No one in the administration is stepping up to accept accountability. The vendors are not accepting responsibility. It is as if the Department of Health and Human Services (DHHS) is just standing there…watching the debacle…doing nothing. I am reminded of Dr. T.J. Eckleburg. Anyone remember who Dr. Eckleburg is? Dr. T.J. Eckleburg’s spectacled eyes are a powerful symbol in The Great Gatsby, one of my favorite novels of all time, written by F. Scott Fitzgerald. Originally, the billboard was erected to promote Dr. Eckleburg’s optometry practice. The eyes are supposed to symbolize commercialism and the greed of America, but the billboard is neglected and the eyes remain throughout the story to symbolize God watching over Nick Carraway and the other characters. The eyes seem to be an all-knowing and all-powerful figure over the characters. The eyes frown down on the characters and judge their actions. Maybe it is not just a billboard. Throughout The Great Gatsby, Eckleburg’s eyes watch. 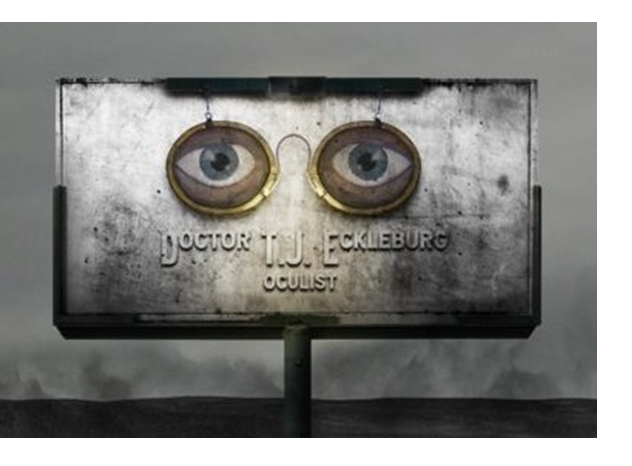 Yet, in the novel, God, symbolized by Dr. T.J. Eckleburg’s spectacles, seems to have abandoned America, leaving only Dr. T.J. Eckleburg behind to stare down with his empty eyes. Dr. T.J. Eckleburg never moves…never speaks. Yet, Fitzgerald creates this looming, unmoving billboard and characterizes the billboard as God. And who is more in charge than God? Similarly, (not as to God, but as to Dr. T.J. Eckleburg), DHHS is supposed to be the all-knowing and all-powerful head of North Carolina Medicaid. That single state entity is DHHS. DHHS is charged with watching over all things Medicaid. DHHS is our Medicaid Dr. T.J. Eckleburg. If DHHS is in charge and Secretary Wos is in charge of DHHS, then (going back to Logic 101) Wos is to blame for the NCTracks debacle. Right? Before jumping up and down and blaming Secretary Wos for NCTracks, remember that it was the prior administration that began the whole NCTracks idea in the first place. 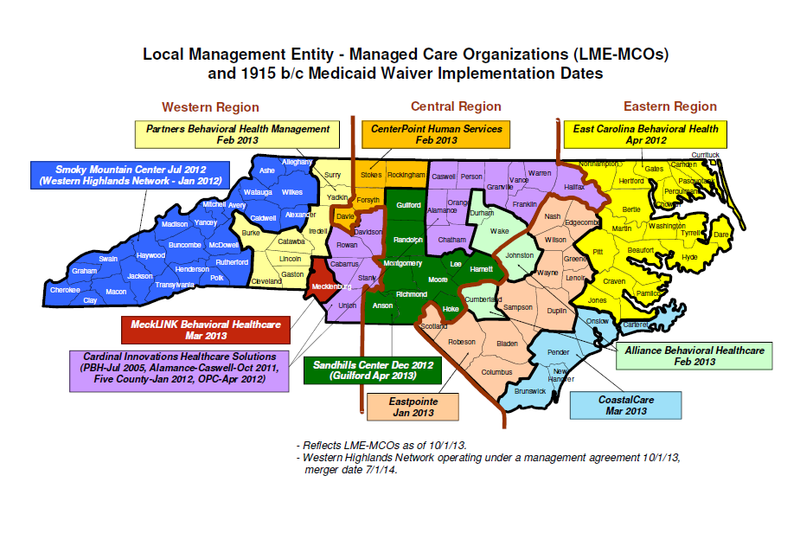 Wos did not come to NC and say, “Hey, let’s change the Medicaid billing system. There is this company CSC that will be so perfect for the job. Let’s pay them a ton of money to revamp the entire system.” No, Wos came to NC with NCTracks already begun. The past administration started this little ball rolling. Wos stepped in when the ball was huge and its inertia kept it going…or should we say Wos did not stop the rolling ball. Does that exonerate Sec. Wos from any accountability and/or blame for the current state of mess Medicaid is now in due to NCTracks? Absolutely not. It is without question that Sec. Wos is charged with managing DHHS. It is without question that Sec. Wos has not accepted the accountability of the NCTracks debacle. Shoot, she hasn’t even admitted there is a problem!! Isn’t admitting there is a problem the first step? Someone at DHHS made a fatal flaw in implementing NCTracks. Someone told HP Enterprises to take a hike without ensuring that NCTracks would work. That is like walking a tight rope with no net! And that fatal decision is on this administration. Like Dr. T.J. Eckleburg, DHHS is watching over Medicaid. And like Dr. T.J. Eckleburg, DHHS is unmoving and silent. DHHS cannot be a billboard. Nonaction is not an option. Right now DHHS is just a billboard. In fact, maybe the most important nonactions to note are what Sec. Wos is NOT doing. She has has NOT blamed CSC. She has NOT condemned CSC. She has NOT had heads rolling at CSC. Sec. Wos has NOT publicly spoken disparagingly about CSC’s implementation of NCTracks. She has NOT terminated CSC’s contract. To my knowledge, she has NOT asked for help from HP Enterprises. Right now, DHHS is nothing more than a billboard, a symbol of Medicaid, but doing nothing. In The Great Gatsby, Dr. T.J. Eckleburg’s eyes never change. They continue to watch. Unlike Dr. T.J. Eckleburg, Sec. Wos can move. She needs to move. Aren’t we to “where necessary” yet? 143 days after the catastrophic implementation of NCTracks and the mess is not fixed….don’t you think it is necessary to hold someone accountable?? Oh, and by the way, during these past 143 days since NCTracks’ implementation, who is getting harmed? The doctors, the dentists, the in-home health care providers who are not receiving proper Medicaid reimbursements. And then who suffers? The Medicaid recipients because providers stop accepting Medicaid. In a Medicaid system that already discourages providers from accepting Medicaid, NCTracks is certainly not helping. Counting business damages, loss of clinical time, and unpaid claims, can you imagine the invoice that the harmed providers should serve on DHHS?? Maybe the invoice sent to DHHS should give DHHS 15 days to request a reconsideration review. One thing is for certain, DHHS (whether or not through Wos) must stop merely being a symbol of Medicaid, a billboard, and start acting… and be accountable. Because after 143 days of this hair-pulling-out, feet-stomping, spit-wielding debacle for most providers, there aren’t many more hairs, stomps, or spit. DHHS Still Claims NCTracks on Track?? CSC Doing Its Best? Today the Joint Legislative Oversight Committee on Health and Human Services met at noon. Mr. Joe Cooper, DHHS’ Chief Information Officer, spoke on behalf of DHHS. He began by explaining that NCTracks is not NC Fast, which I believe we already knew. Most interestingly, it was stated that DHHS has assessed approximately a quarter of a million dollars in penalties against CSC since NCTracks going live. These assessments are paid to the state. To which I ask, “Why does CSC pay penalties to the state? Why not pay the people actually damaged by CSC’s ineptness..the unpaid providers?” It makes no sense that, while providers are not getting paid, CSC pays the state. That’s like a robber paying restitution to the insurance company that never covered the losses of the victim. When asked a follow-up question about whether the number of backlogs was similar to a previous number of approximately 43,000, Mr. Cooper noted that there are two types of backlogs. One backlog addresses prior authorizations, and, according to Mr. Cooper there is no more backlog as to prior authorizations. NCTracks is absolutely current. The non-current backlog is regarding returning calls and responding to emails. Providers, Is it true? Is NCTracks current as to prior authorizations? Mr. Cooper further stated that calls to the Call Center are now answered within seconds. Last week CSC implemented a new process for answering phone calls that when providers call the Call Center, CSC estimates when it will call back the providers in order to stop the providers from staying on the phone too long. That’s great, but getting an estimated time for a callback doesn’t really resolve the problem, right? 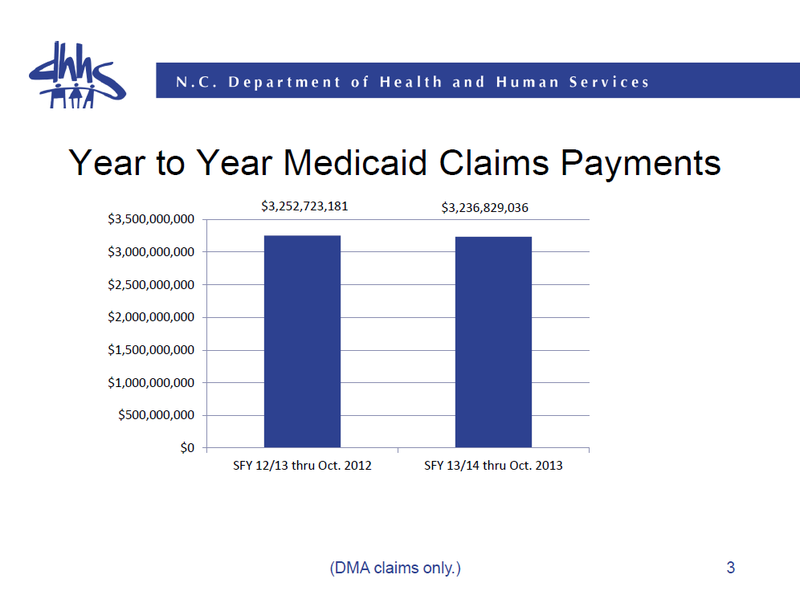 Mr. Cooper also showed a graph depicting total Medicaid claims payments from State fiscal year 2012 through October 2012 (the graph on the left) and payments from State fiscal year 2013 through October 2013. Obviously the point of this graph is to demonstrate that CSC is approximately right on track with what HP Enterprises paid last year. And, I agree, when looking at this graph, it appears that both CSC and HP paid out similar amounts for the different years. But the graph does not explain whether the volume of claims increased from 2012 to 2013. One would think that the number of claims increased in 2013, as our population grew. So is the comparability of the graph deceiving? 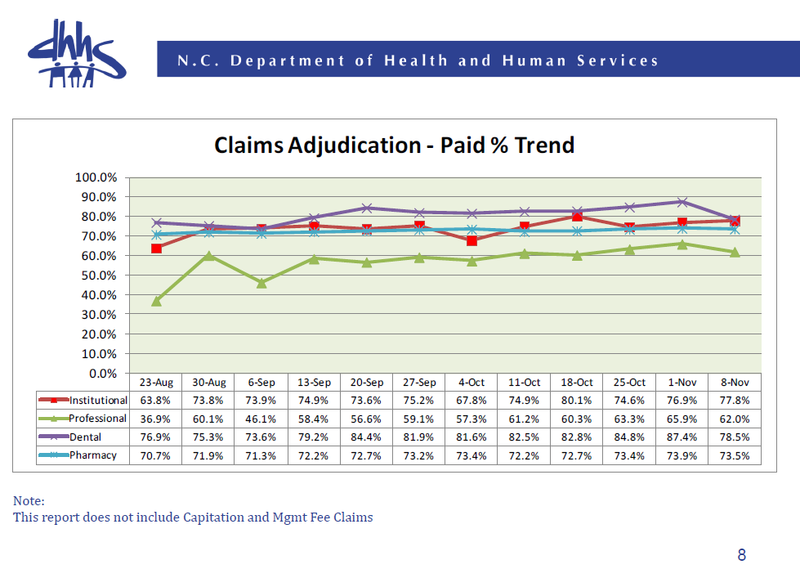 Senator Nesbitt pointed out that, according to the chart, it looks like claim adjudication is declining. He sais that he heard someone mention that 70% is the goal, but he doesn’t think that 70% is a good goal. Why not 100%? In the Future, Could Physicians Be Forced to Accept Medicaid? 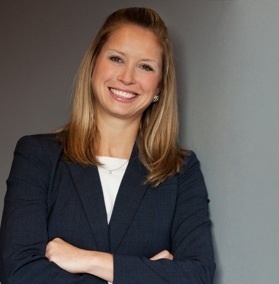 According to a report in the “Mason Conservative,” Virginia Democrat delegate candidate, Kathleen Murphy, stated, during a debate, that the government should force physicians to accept Medicaid. After reading that, how many of you shuddered from horror? I think we can all agree that we need more physicians to accept Medicaid. We simply do not have enough physicians to meet the needs of all our Medicaid recipients. Not enough physicians equals not enough quality health care to our most needy. In particular, rural areas suffer most from the lack of physicians who accept Medicaid. According to Forbes magazine, “Right now, the United States is short some 20,000 doctors, according to the Association of American Medical Colleges. The shortage could quintuple over the next decade, thanks to the aging of the American population — and the aging and consequent retirement of many physicians. Nearly half of the 800,000-plus doctors in the United States are over the age of 50.” I’m sure Forbes would have found even more shortage had it researched the rural areas. But is the answer to force doctors to accept Medicaid? A week or so ago I saw my primary care physician. I’ve seen my primary care doctor for years. (We will call him Dr. Bob). He’s a native North Carolinian, just like I. So he knew me in college, law school, and for the past 13 years of my legal career, both pre-baby and post-baby. Until a week or so ago, I always knew Dr. Bob accepts Medicaid as a form of insurance. I liked that he did. Per our normal routine, Dr. Bob asks about my husband, my daughter, and my job. But, usually he is extremely interested in “all-things-Medicaid.” He normally asks the status of reimbursement rates, my opinion on the current administration, my perception of the trend at my job (who was getting audits, who may be getting audits soon, etc. ), and other various Medicaid-related issues. Instead, Dr. Bob says, “I’ve decided to no longer accept Medicaid.” (My jaw is agape). My third instinct is to actually ask HIM why HE made this decision. (My first couple instincts are usually the wrong route). As a primary care physician, the bulk of his Medicaid work is conducting physicals (or what Medicaid calls, “preventative care”). DMA Clinical Policy 1A-2 defines preventative care as, “An adult preventive medicine health assessment consists of a comprehensive unclothed physical examination, comprehensive health history, anticipatory guidance/risk factor reduction interventions, and the ordering of gender and age-appropriate laboratory and diagnostic procedures.” (emphasis added). I’ve seen this before. In behavioral health care audits, an auditor with no substance abuse clinical background determines no medical necessity exists for a service for a Medicaid recipient suffering from substance abuse. In dental audits, an auditor without ever attending dental school, will determine that a partial implant is not medically necessary. N.C. Gen. Stat. 108C-5 requires that, “[a]udits that result in the extrapolation of results must be performed and reviewed by individuals who shall be credentialed by the Department, as applicable, in the matters to be audited, including, but not limited to, coding or specific clinical issues.” (emphasis added). Credentialed in the matters to be audited. Is DHHS seriously credentialing non-physicians to audit physician? Non-dentists to audit dentists? Non-substance abuse clinical providers to audit substance abuse clinical providers? I do not know whether DHHS is credentialing the auditors, but, in my experience, non-qualified auditors (in the field in which they are auditing) are conducting audits. Going back to my original premise, are we going to force/require that physicians, in order to be physicians, to accept Medicaid, thus subjecting themselves to limitless and unannounced Medicaid audits? To force physicians to undergo the administrative burden that comes with Medicaid audits, not to mention the administrative burden to just follow Medicaid regulations? To force physicians to accept the quite possible possibility that the physician will need to defend him or herself against audits and incur steep attorneys’ fees? In Dr. Bob’s case, he did accept Medicaid for years. Then, he consciously made the decision that he no longer wanted to be subject to the regulatory scrutiny that comes with accepting Medicaid. So, now, would we force Dr. Bob to undergo the very scrutiny he so loathes? It would be similar to the State forcing all attorneys to accept clients at a discounted rate and accept the threat of audits. Or forcing accountants to accept clients at a discounted rate and accept the threat of audits. Or forcing a plumber to accept clients at a discounted rate and accept the threat of audits. Don’t we, in the United States, have the economic freedom to own private property, thus, logically, allowing us the right to pursue private property? See the Declaration of Independence. I understand that Ms. Murphy’s comment was just that…a comment at a debate. But her comment demonstrates that, while politicians understand there is a shortage of physicians who are willing to accept Medicaid, some politicians may believe that physicians should be forced to accept Medicaid. But aren’t we all entitled to the economic freedom to pursue private property, happiness, and liberty? Or is that all a ruse?